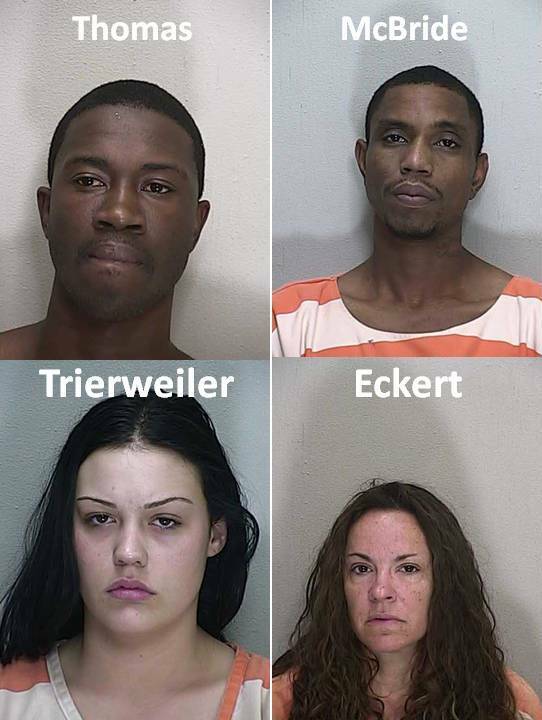 Ocala, Florida — The Ocala Police Department says they have arrested four individuals that were involved in the string of smash-and-grab car burglaries that took place on May 14, 2014. The suspects were arrested following a short police chase in the evening hours of May 16, 2014. Marcus Emmanuel Thomas, 28, Tavaras McBride, 33, Holly Lorraine Eckert, 46, and Alyssa Trierweiler, 19, are now booked into the Marion County Jail — they are facing a long list of felony charges. The two men are from Fort Lauderdale — Trierweiler is from Tampa and McBride is from Orlando. The pack of four thieves have been traveling from county-to-county, burglarizing vehicles along the way. They are now suspects in multiple car burglaries throughout the State of Florida. Authorities say the group always broke into cars that were in public places. Alachua County investigators say they believe this group is also connected to similar auto burglaries that occurred at a Newberry ball field. Along with stealing electronics and cash — they were also cashing stolen checks, using ATM/debit cards as well as stolen credit cards. They have left a long trail of crime, and other cases are now being investigated, detectives said. According to the Ocala Police Department, 16 vehicles were burglarized on May 14, 2014, and it all happened within two (2) hours, between 5:45 p.m. and 7:34 p.m. The burglaries happened at Jervey Gantt Park, the YMCA and Ward-Highlands Elementary School. Park goers can now rest a little easier knowing that these criminals are behind bars. All four suspects are being held without bond at this time. The total amount of damages caused by the group has not yet been determined.